Keturah follows a legendary hart deep into the forest, where she becomes hopelessly lost. Her strength diminishes until, finally, she realizes that death is near–and learns then that death is a young lord, melancholy and stern. Renowned for her storytelling, Keturah is able to charm Lord Death with a story and gain a reprieve–but he grants her only a day, and within that day she must find true love. Martine Leavitt offers a spellbinding story, interweaving elements of classic fantasy and romance. From this you can see a few things, first, I read this book in one day. Second, it is obvious that I thought that the writing was beautiful and I have since bought my own copy so that I can take notes during my inevitable re-read. Many things happen in this story and the plot is all interwoven as Keturah spends each day talking her way out of Death’s grasp. As Keturah struggles to save those she holds dear, she begins to lose herself to Death’s embrace. Over time, Keturah learns that death is a part of life, and there cannot be one without the other. She learns what it means to truly live, and what is worth fighting for, and that sometimes life doesn’t turn out quite how you thought it would. The novel is very straight forward and reads as if it is being heard around a campfire. There are no questions or twists in the plot, and things happen as you would expect. It is the setting that really drew me in, as I was reading, I couldn’t help but think of dark forests filled with fog and hard to place noises. It was reminiscent of Sleepy Hollow in the way that it made me feel chills along my spine with the barest hint of dark shadows. I did have a tiny bit of confusion and frustration over the format of the book. You see, it is presented in a way that show Keturah as the teller of the tale and as the main character in the narration. Therefore, at the end of the novel, looking back on the events that befell her, the reader is presented with a moment of confusion: If Keturah is telling this tale to a group, how can it be as true as she promises? What really happened to Keturah? Additionally, I wanted more. 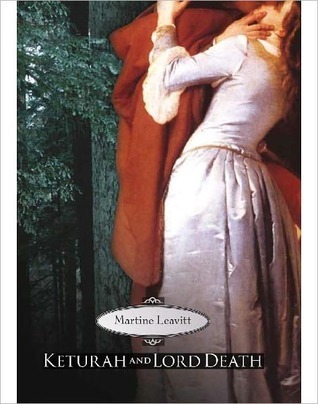 I wanted more of Keturah, and Lord Death. As I turned the last page, I desperately wanted to know what happened to the duo. Due to it’s narration, the ending brought me up short and I couldn’t help but feel frustration and bittersweet emotion over the conclusion. Keturah and Lord Death was written in a way that brought you along on a beautiful journey of growth, discovery, and love. It read much like 1001 Nights, leading you along, one step at a time. It has made it’s way into one of my favorite novels of all time, and I highly recommend it. 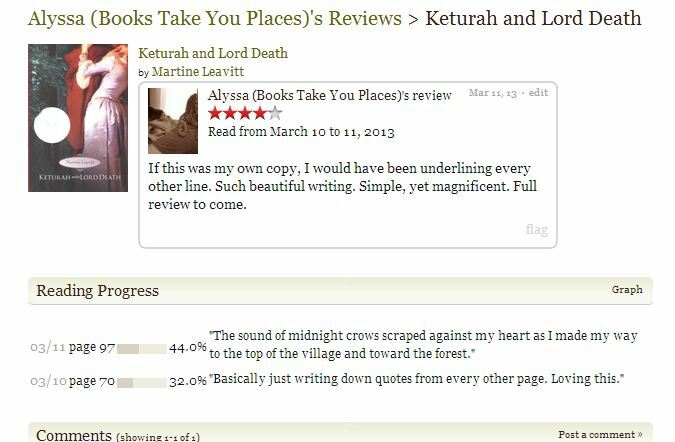 This entry was posted in Reviews, Young-Adult and tagged death, fairy tales, romance, young adult. Bookmark the permalink. Very cool! What a great review. Sounds like the book is a little bit conflicted with the beauty of the writing but just confusing the way the narration is set up. I kind of love seeing death personified. I don’t know why but I think it’s such an interesting concept! Okay… this book sounds AWESOME. 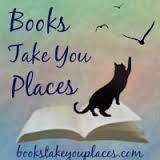 You know I’m a huge fantasy fan, especially those that are written beautifully! Will totally be checking our library to see if we have this! Great review!!! I’ve wanted to read this since reading one of Leavitt’s books last year, where I just fell in love with her writing. And knowing my love of a personification of Death? Of course this went on my list! I’m so glad to see you enjoyed it so much, enough to buy your own copy! I haven’t read any of her others but I can’t wait to do so!! Obviously you will love this one for many reasons but we loves is some Death!! I feel like my review didn’t even do it justice, to be honest! It was all FEELINGS!!! Hahah! I did get my copy in the mail this week and I can’t wait to re-read!! OBVIOUSLY, I need to read this, like, YESTERDAY. Just those few little snippets in your review are gorgeous; I can’t imagine how they compare to the whole thing! Seriously though, I’ve had this book on my kindle for at least a year. Now I’m completely motivated to read it, because if you loved it, then I shall love it. Read it soon!!! It’s short and gorgeous and I KNOW you will love it!! This book sounds absolutely lovely! I can tell I’m going to like it, based on what you had to say in your review. Plus, the curious concept of Keturah talking her way out of Death is already enough to catch my interest. I’ll be checking this one out soon! I think that you’ll really like this one! It is quick and beautiful! I liked this book a lot too-I think it might be deserving of a reread as I’m not sure I fully appreciated it when I first read it.